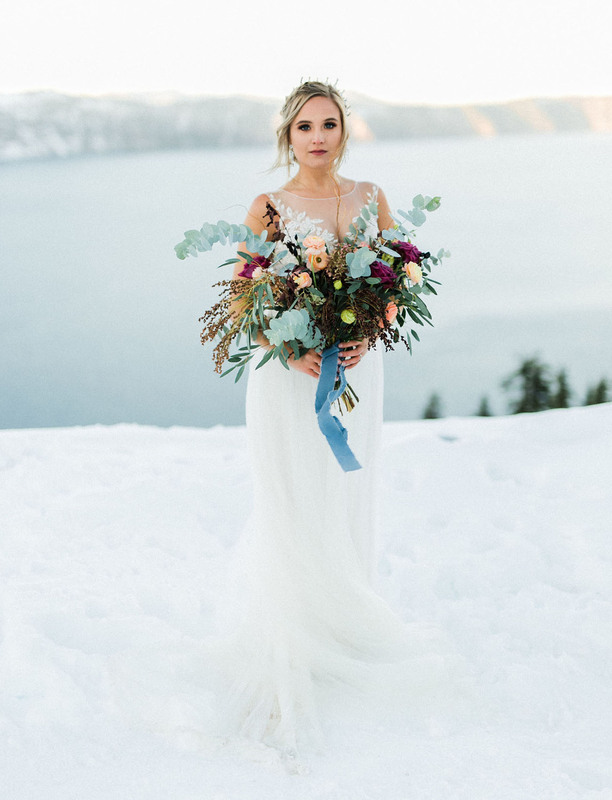 Inspired by the fog rising off the water, and the wintry chill that comes with first snow of the season — today’s editorial will have you forgetting about Frozen and all eyes will be on this ice queen! 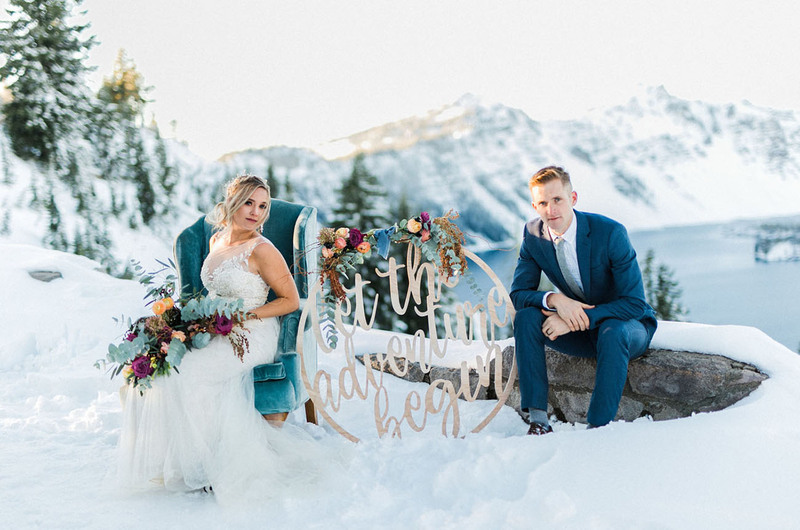 Focusing on the color of slate blue, along with vibrant pops of purple and apricot — the designer + planner, The Bloom & Co., had the idea of creating something icy, enchanting, and with a slight boho twist. The setting? Oh just the breathtaking landscape of Crater Lake National Park in Oregon! 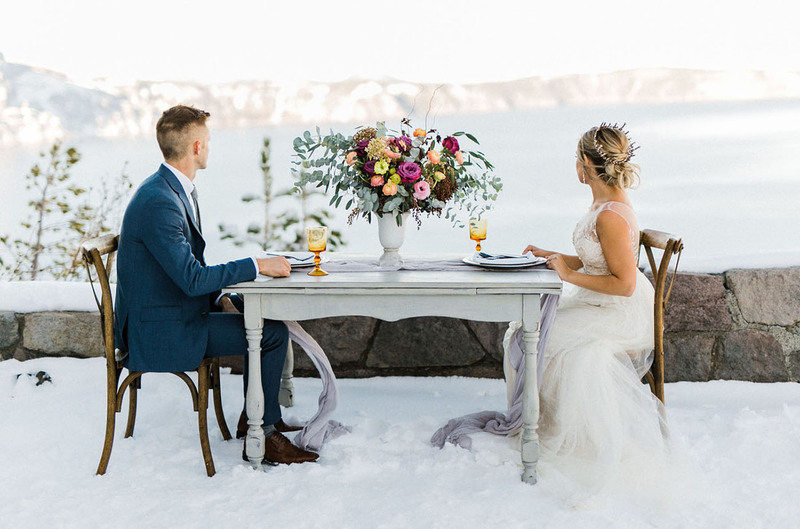 Christine Sarah Photography tells us: I wanted to plan a romantic shoot that captured simple elegance in the details. 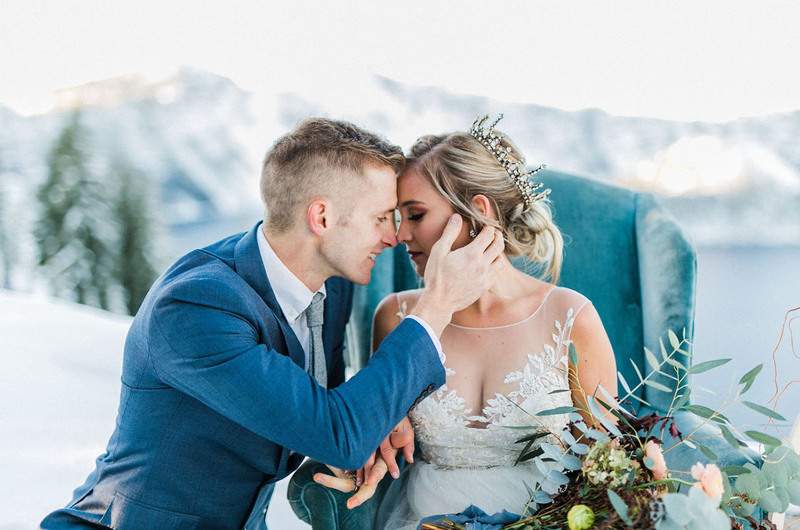 Since elopements are intimate, it doesn’t mean that the bride and groom have to sacrifice on all of the beautiful details! We definitely agree with that sentiment! 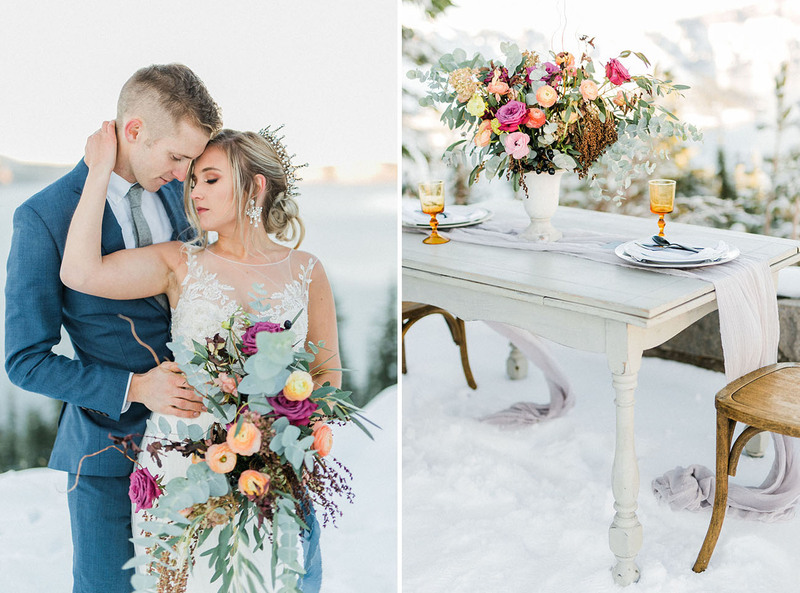 Ready to be positively transfixed by this winter wonderland, with a sprinkling of boho-inspired details? Let’s wander! 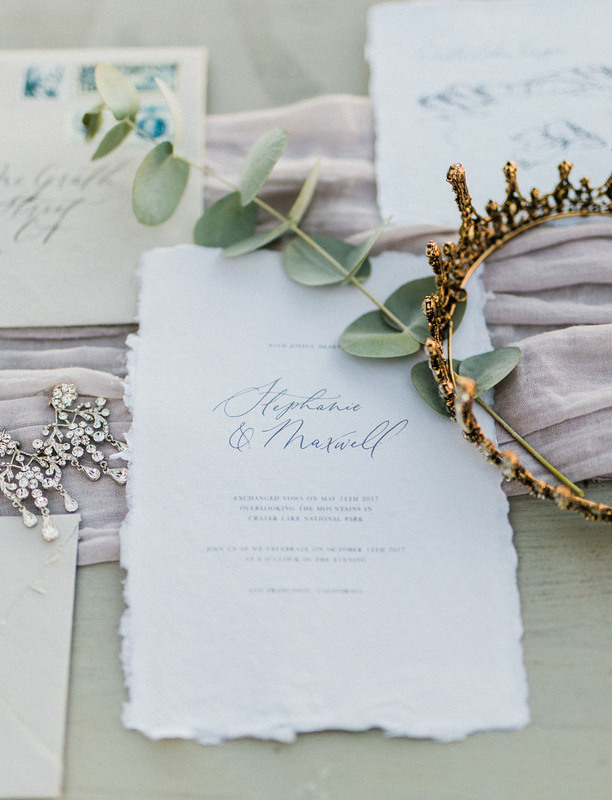 Setting the stage for a refined + cool day, Little North Company crafted this gorgeous invitation. No ice queen could do without her crown jewels, right? 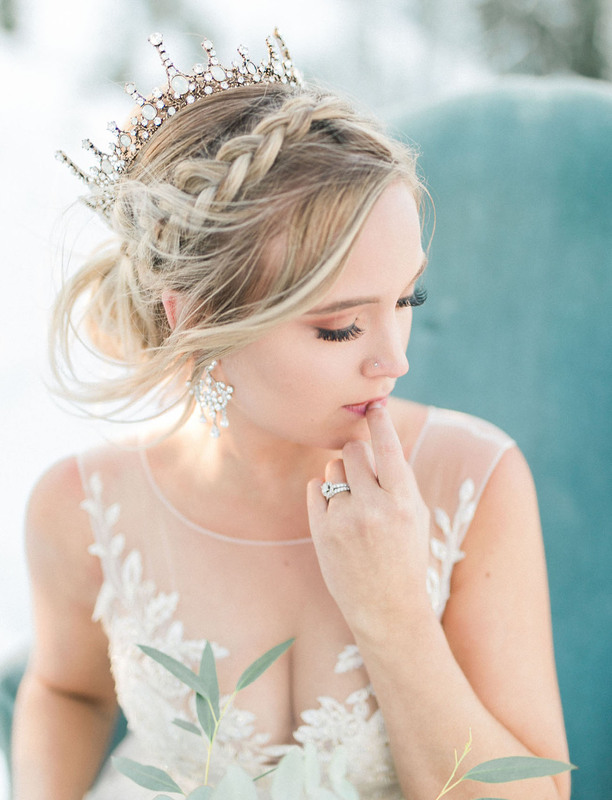 This glittering beauty is from Eden Luxe Bridal. And keeping this beautiful lady looking extra glam was makeup artist, Robin Opal, along with Kacey Reyes, who crafted the perfect romantic updo. 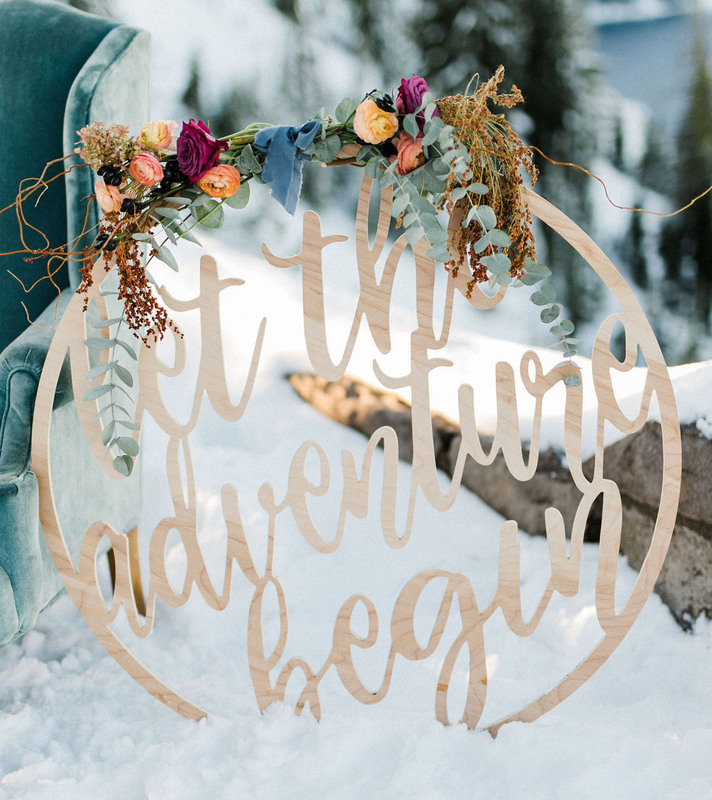 We’re all about the adventure! You too? Snag a sign of your own from Feather and Birch! 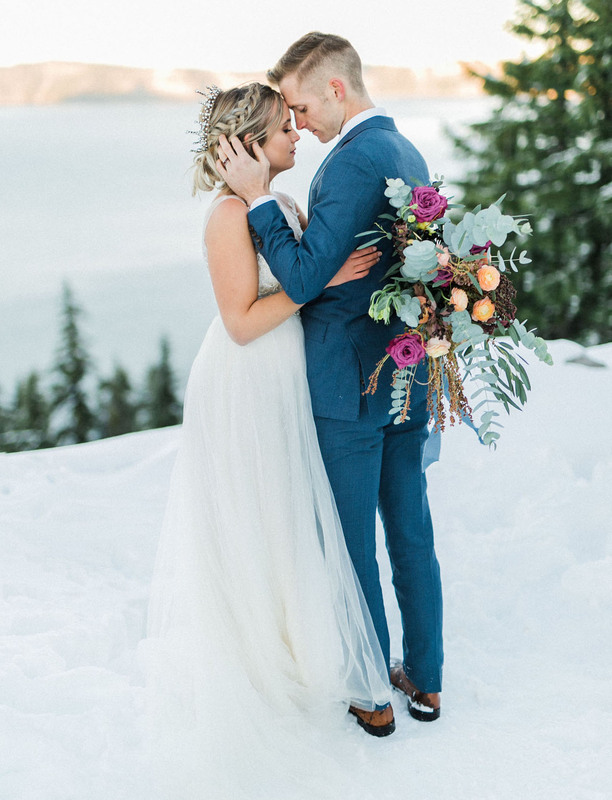 It was all about bold pops of color to stand out from the snowy landscape! The Bloom & Co. paired bright ranunculus with tons of baby eucalyptus and an array of other cheery picks for this stellar arrangement. As for that sultry gown? It’s by none other than Sottero & Midgley. 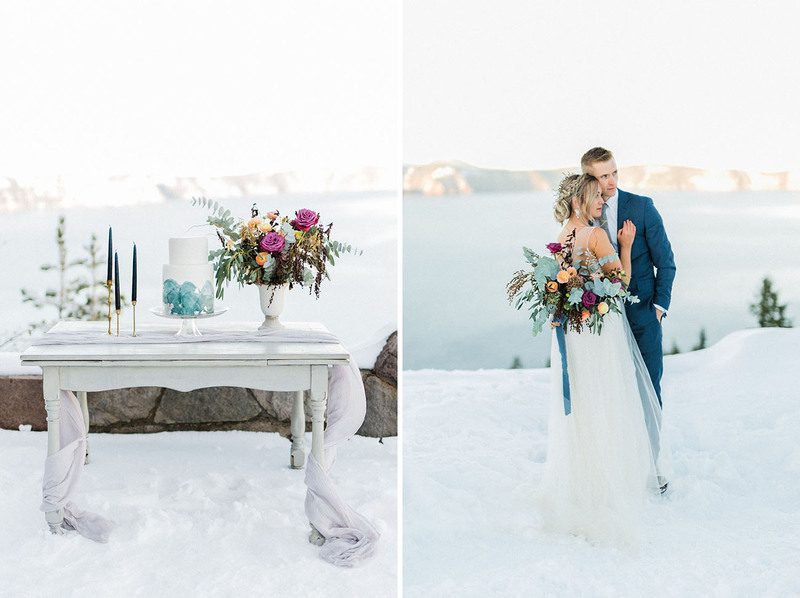 Have you ever seen such fun pops of color in the snow?! We absolutely ADORE this! 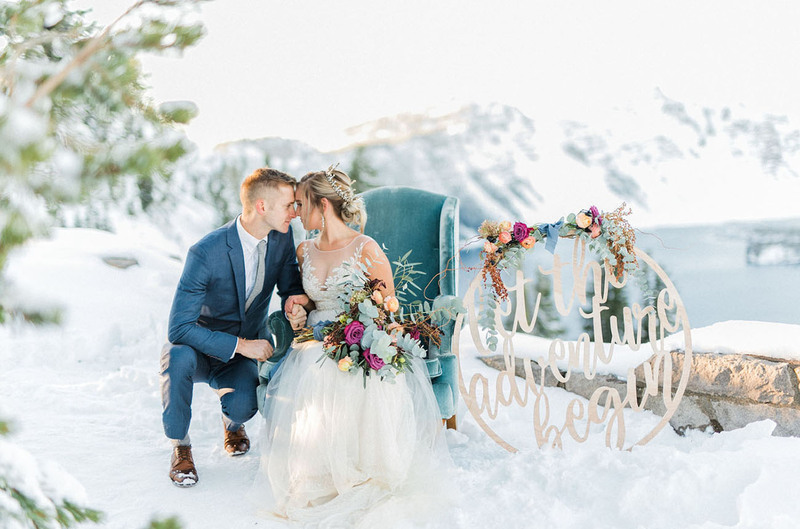 Now, who’s ready for a winter wonderland trip… or better yet, to design + plan a winter wedding? 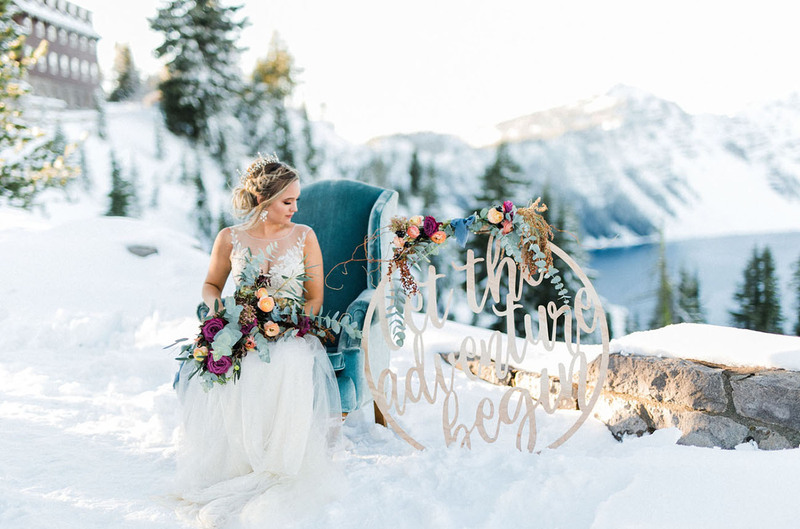 photography: Christine Sarah Photography // venue name: Crater Lake National Park, Southern Oregon, Oregon, USA // event design: The Bloom & Co. // planning: The Bloom & Co. // florals: The Bloom & Co. // wedding dress: Sottero & Midgley // hairpiece: Eden Luxe Bridal // hair stylist: Kacey Reyes // makeup artist: Robin Opal // calligraphy: Little North Company // handmade details: Feather and Birch // cake: Sugar Rush Bakery // tabletop rentals: Minery Rentals // furniture rentals: Party Gallery Medford // linen rentals: L’Ecoliere // specialty rentals: Tono & Co.
I’m not a fan of crowns, but it works here. I just adore Winter portraits.